Filters are based on the teamfocus search function and provide you with different ways to see your data. Filters are essentially saved searches that you create, either for your own favorites or to share with the whole team, and they’re one of the most powerful features of teamfocus. Once you’re signed into into teamfocus, click on the “Show my Filters” icon in the top left hand corner. This will then display a list of your Filters that are defined for your Team. The “Favorites Filters” displays Filters that that are important to you, and those that have the group icon clicked (high-lighted in blue) will also be shared with your Team. If you would like to unshare a Filter with your Team, just click the group icon to make it white. Your Team leader may have already made your Filters, or you may be using the default Filters teamfocus provided when your Team was created. Each Filter also displays the number of matching Tasks on the Click on the Filter name for example “Active Tasks” to display all tasks that result from that particular search. Note: See the article on searching if you’d like more details on the searching syntax, and the many things you can do with it. The “Find Tasks” tab lists all of the standard available searches for you to create a new Filter from. It’s a quick way to get up and running with some Filters that show the data you’re interested in seeing. You can of course customize each Filter further by editing them, this way you can sort and target the precise data you need and display it in the way that best suits you. See our help section here on Searching for more information about how to do this. 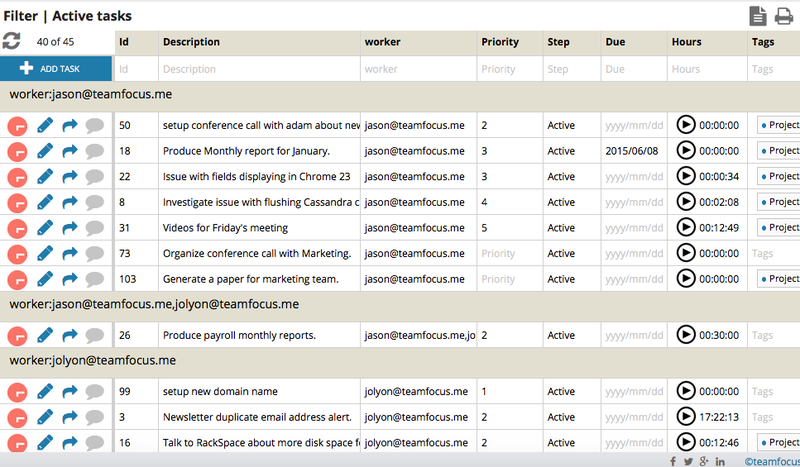 All of the Tasks in the Filter are displayed in a table like a spreadsheet. The Filter you clicked on most likely already has some information to display, and is sorted by predefined attributes such as “by worker” or “by task Id”, all of these can be altered to match your needs. In the example below, the Tasks are grouped by worker. Each workers get their own headings (as they’re grouped together with a “groupby” command in the search and the Tasks are then sorted accordingly. Example: Click the hours column heading to sort all tasks by ascending or descending time. To save it, click on the ‘Save Search’ button below the main search bar.